i was hoping to get about a month and a half to complete the project from conception to installation, but i was delayed by bureaucratic crap as i had to wait for the green light. this is understandable...i don't like it...but i get it. now i'm working on the pieces. and in all honesty, the month to complete it is plenty of time. but the nature of working with slabs is that you need to work with them to prevent hairlining fractures and warping. this entails slow drying and constant flipping of the clay. even then you still get flawed slabs. monsoon season marks the beginning of the hot and humid summer season in korea, which for me means that my slabs are just not drying. i have been waiting weeks for the slabs to dry and that is starting to worry me. 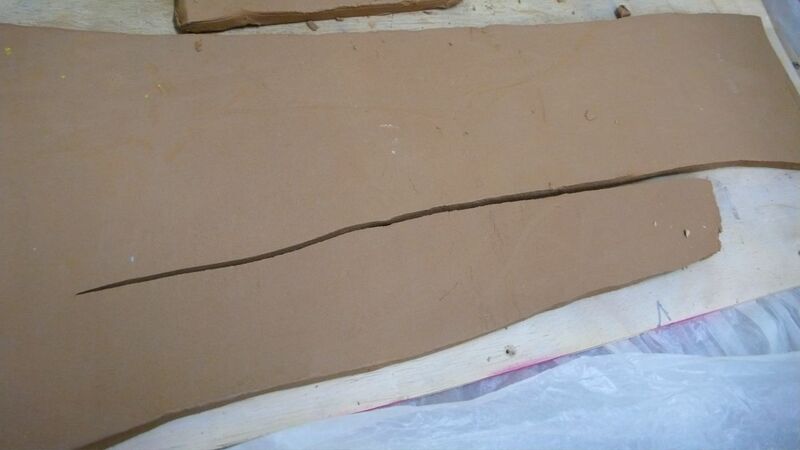 remove all my preventative measures to dry the clay slowly and the clay just might dry...but too quickly, leaving me with flawed slabs. now i made many slabs to ensure that i get my perfect one...but i only really have one chance at this. come august, i leave korea. working with slabs is not exactly my specialty, but i know my way around them. it just with this kind of scale (over half a meter tall and over a meter wide), it makes it bit of a challenge. Good brief and this enter helped me alot in my college assignement. Thanks you on your information.